The U.S. Navy has launched an investigation into the USS Fitzgerald guided missile destroyer’s collision with a Philippine-flagged container ship that occurred approximately 56 nautical miles off the coast of Honshu in Japan early Saturday. The impact caused significant damages to the Fitzgerald pilothouse and commanding officer’s cabin as well as flooded a machinery room and two berths for 116 sailors who were onboard the warship, Vice Adm. Joseph Aucoin said in a statement published Sunday. 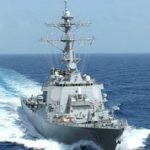 He noted the crew conducted damage control efforts to stabilize the Arleigh Burke-class destroyer and sail it back to a U.S. naval base near Yokosuka on Saturday evening. Japanese allies have provided support and assistance to Navy’s response efforts and the service branch has notified the families of personnel who died from the ship collision. “We recognize that there are other organizations who have equities in this incident, and we expect they will conduct their own separate investigations. More information on any further investigations will be forthcoming,” Aucoin added. The investigation, led by a flag officer, will cover both JAGMAN administrative and safety assessments.